On your marks…. get set…. GO! 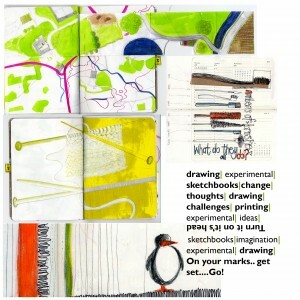 1 day Masterclass- Drawing, sketchbooks and ideas. This will be the first of a series of workshops lead by Claire Heminsley, which will help you to develop new directions and unexpected outcomes, invigorating your practice. This developmental work can be applied to any discipline e.g. graphics, illustration, textiles, ceramics, fine art. All designers and artists need this time to nurture new ideas and challenges, this day workshop aims to be the springboard. During the day the aim is to either consolidate current ideas or instigate new thoughts for development. Drawing exercises, collage, experimental sketchbook work, narrative development, mono print, imagery and words are some of the methods which will be used to get you going! Claire Heminsley trained in textiles at the Glasgow School of Art and has worked freelance trading under the name Incahoots for the last 29 years. Drawing is at the root of all her work and she has applied this to a wide range of textile and illustration projects. She constantly challenges her own practice so has first hand experience of the value of nurturing the development process.